The physical and behavioral evolution of the domesticated horse began millions of years ago: scientists say as long as 55 million years, a small mammal with toes was known as Hyracothenium or Echippus. This small mammal is known to have spent much of its time browsing and grazing on live shoots and the leaves of trees. Scientists have documented this history with a comprehensive collection of fossils tracing the prehistoric animal to the Equus of 2.5 to 3 million years ago. Horses in a domestic setting look for guidance and an alpha leader. Fortunately for the horse, the evolution led to a relatively large animal that is fast for its size and weight and has a strong inborn survival instinct. The horse developed the physical and brain capacity to not only survive in the wild, but also to change as the climatic and physical conditions of the earth changed. Modern horses exhibit survival behaviors that originated when they were much smaller and more vulnerable to predators. Eventually, browsing horses crossed back and forth over the land bridge along what is now known as the Bering Straits between North America and Siberia and continued to evolve in North America due to the vegetation of the area, as did the animals that migrated back into Eurasia. At some point the horse became extinct in North America and was reintroduced when Columbus landed the animals in Haiti in 1493. These grazing animals adapted to their habitats by growing larger, developing high crowned teeth, a longer muzzle, changes to the eye structure allowing a wider field of vision, lengthening of limbs and development of hooves to replace toes. The brain and loco-motor systems developed specialization capabilities, giving horses mental alertness and the ability to sustain flight and outrun predators. Much debate remains about the differences of modern horses and their origins, but it appears that the modern horse Equus caballus diverged from other modern day equids such as the zebra and donkey some 1.5 million years ago and were domesticated by local populations. The behavioral evolution was closely linked to the physical evolution because of the necessity of survival. The horses that adapted to the environment lived longer and left more descendants than the animals that did not adapt. Horses are keen to run when frightened. Movement, even far away, draws the attention of the equine. A horse knows instinctively that it has two options when confronted with an unknown threat - flight or fight. Given a threatening situation, the horse's main motivation is to escape from pressure and get to a place where it feels safe and free. 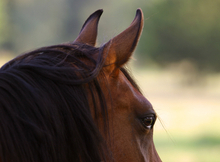 Horse's are simple in their thinking and in their minds, people are often seen as predators. This is why horses, especially stallions, will lash out with feet and teeth when feeling cornered. Horses have a natural herd instinct and find comfort and safety in numbers. As with most animals in the wild, a leader or alpha horse is looked to for direction and maintenance of a safe environment. 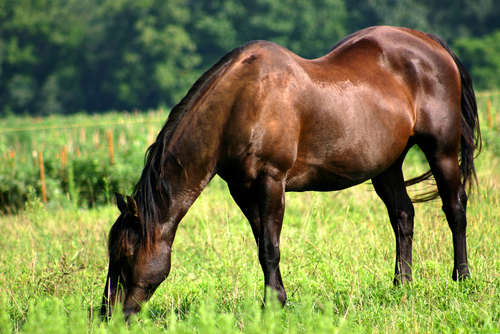 A horse must keep its head down to eat and loses the ability to see what is going on around it. Being part of a herd where some animals are 'watchers' while others graze gives a horse a sense of safety. 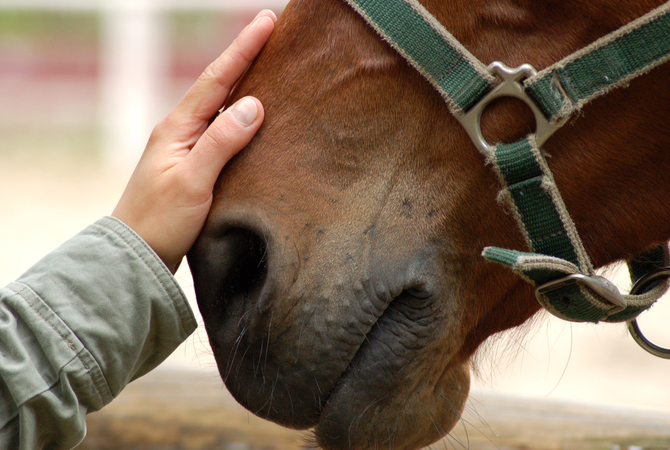 A horse's feet are closely tied to a mental state of fear or safety. Instinctive fear takes over when the feet are held or trapped and it is natural for a horse to avoid stepping into mud or water when the depth cannot be judged. Horses are willing to accept leadership from persons who understand how to act as a dominant herd member. When a horse pulls its foot away when you attempt to pick it up, it's because of this instinctive fear. Most horses evidence fear and wariness when a dog is running around while their hooves are being picked or shoed ,and they are forced to stand on three legs. This natural wariness exists because down through history, dogs have been known predators. The horse's natural reluctance to have anything on its back is related to the fear of a predator gaining control by getting on the back of the horse to bring it down. This instinct is direct opposition to what most people want to do with their horses. Fortunately, when horses at a young age are handled well, this reluctance can be overcome with patience and reassurance. In short, the historic physical changes in the horse's body and mind have a direct influence on the way our domesticated horses see the world and the humans with whom they interact. In times of stress, horses will act from instinct whether it is to strike out or flee. Horses in a domestic setting look for guidance and an alpha leader. It is up to you to take your role seriously and act upon it. A delicate balance between trust and respect of authority needs to be established from the get-go with all horses. An undisciplined horse will revert to its natural instinctive behaviors when it feels frightened or threatened. An undisciplined horse is a potentially dangerous one.